(CAMBRIDGE, Massachusetts) — The biologically-inspired, assistive soft exosuit under development at the Wyss Institute for Biologically Inspired Engineering at Harvard University and the Harvard John A. Paulson School of Engineering and Applied Sciences (SEAS) has given wearers an advantage in their energy expenditure in a new study published in the Journal of NeuroEngineering and Rehabilitation. For the first time, a soft wearable robot has been shown to improve walking economy, which could lead to new devices to enhance or restore gait for many types of wearers. In the study, healthy participants wearing the soft exosuit walked on a treadmill while carrying a load equivalent to 30 percent of their body weight. 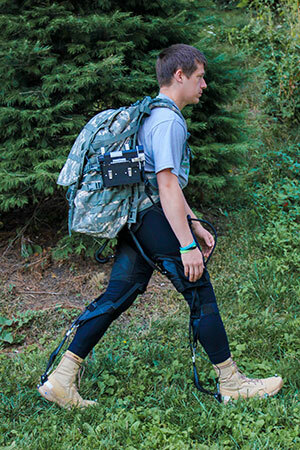 Despite the weight of the device, the exosuit reduced the amount of biological work required by the lower limb joints, resulting in an overall energy savings of approximately 7 percent. Over time, that amount of energy savings equates to a difference of about 13 lbs., which could greatly help fight off fatigue-related injuries. The exosuit, which is supported by Defense Advanced Research Projects Agency (DARPA)’s Warrior Web Program, is being developed by Wyss Institute Core Faculty member Conor Walsh, Ph.D. and a team of collaborators. Their efforts aim to delay the onset of fatigue and reduce the risk of musculoskeletal injury in military personnel – who often carry heavy gear over long distances – but could also one day be applied to rehabilitate or assist people suffering from reduced lower limb mobility due to injury or disease. “This exciting finding is the result of the efforts of a team of engineers, roboticists, functional apparel designers and biomechanists as well as collaborations across multiple institutions. It is a great demonstration of the value of bringing together a multidisciplinary team to solve hard problems,” said Walsh, senior author on the new study, who is also John L. Loeb Associate Professor of Engineering and Applied Sciences at SEAS and Founder of the Harvard Biodesign Lab. During its development, the soft exosuit has inspired the innovation of entirely new forms of functional textiles, flexible power systems, soft sensors, and control strategies that integrate the suit and its wearer in ways that mimic the natural biomechanics of the human musculoskeletal system. Study co-author and biomechanics expert Ken Holt, Ph.D., P.T., Associate Professor at Boston University’s Department of Physical Therapy and Athletic Training, has worked alongside Walsh and the team since the beginning of the project and has helped the team grow their expertise in running protocols to evaluate the effect of the exosuit on wearers. Now that the exosuit has performed well in proof-of-concept testing, Walsh’s team is engaged in a follow-up phase of the DARPA Warrior Web program where they are working on optimizing the exosuit’s design to make it more efficient and lightweight while increasing its application of force and assistance to the wearer. They are also fine-tuning the exosuit’s interface with the wearer to improve comfort and upgrading the control algorithms so that the delivered assistance can be adjusted across different people.